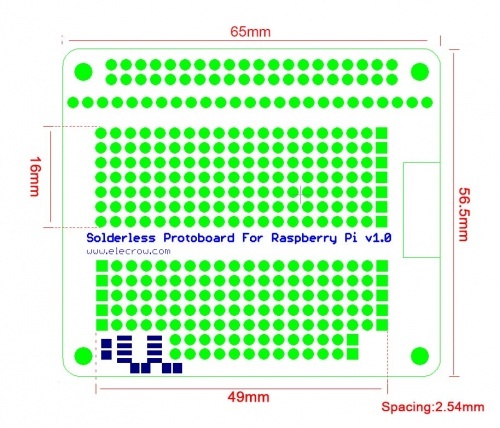 This a solderless protoboard for raspberry pi,it have a printed circuit board and a single 2*20 GPIO header for raspberry pi to put your Perma-Proto on top of you Raspberry Pi. This version also comes with a 24C32 I2C EEPROM soldered on and connected to the EEDAT/EECLK lines. Nearly every pin you could want to connect to the pin are drawn out(Except for #26). You can easily insert the components on the breadboard and connect to raspberry pi to do a variety of interesting experiments. Compatible with all kinds of the Raspberry Pi. Attaching chips, resistors, LED, potentiometers and more. Strips for +3V, +5V and Ground connections to the Raspberry Pi.